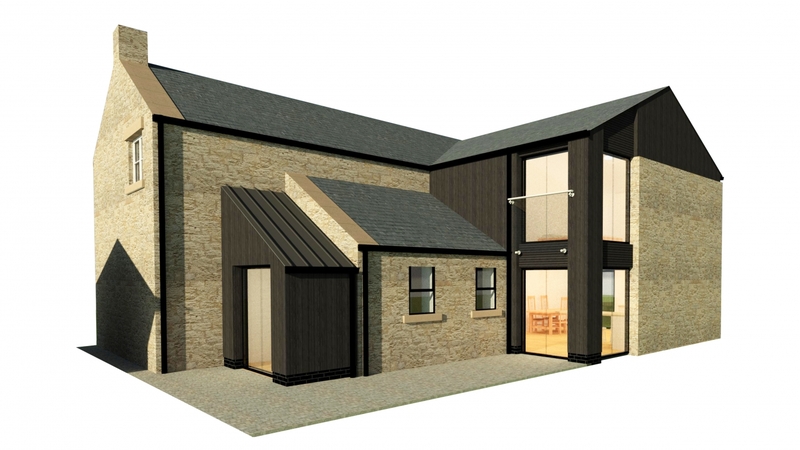 Set on the edge of the Northumberland Park with stunning views of the Cheviots, after a period of personal and bespoke design development with our client through RIBA Stages 0-3, we are delighted to announce that planning permission has been granted for an extension to this 1800s detached farm cottage near Otterburn, Northumberland. The extension supplies the family with a new, contemporary open plan kitchen and dining area on the ground floor and new larger master bedroom and en-suite accommodation on the first floor. The extension is “carved open” at the North East corner, enabling the kitchen/dining area and master bedroom to take advantage of beautiful long range views out across the Northumberland landscape. Responding to the materiality of the surrounding historic agricultural architecture, stone and black timber are implemented as the main materials, giving the extension a strong link to the local surroundings.